While working on my new book, I finished up a chapter where, in response to a reader’s question, I demonstrated how you can count commas in a document with both the StringReplace command and the RegExReplace() function. The StringReplace command responds to the UseErrorLevel parameter to save the count while the RegExReplace() function automatically counts the number of matches for saving in an OutputCountVar variable. 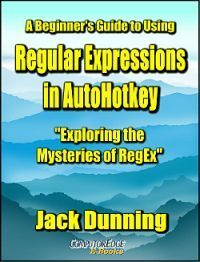 That gave me the idea to write a word count script using RegExReplace(). Note: The StringReplace() function, which supersedes the deprecated StringReplace command, counts in a manner similar to the RegExReplace() function. I also have a problem with filenames which include a dot (filename.ahk) returning two words. I could add the dot ( . ) to the expression but that would cause any concatenation operators to count as a word. This gets crazy! I can certainly find methods for dealing with the variations needed in the Regular Expressions but how accurate do I need the count. At some point, I realize that I either accept my word count as close enough or continue working on the Regular Expression—which could end up ridiculously complicated. When working on the WordPress blogging software, I get a continuous update on the number of words in the blog. In testing the WordPress count, it does everything that I need. I guarantee the WordPress algorithm involves a significant amount of complexity. Select the text for word counting, press the CTRL+WIN+ALT+W Hotkey combination, then AutoHotkey pops up the number of words in a MsgBox. If you use software which includes word counting, then you probably don’t need this script. However, if you use Notepad or another non-counting app, you may want your own specialized script.